What's Up New Haven: 2013 Christmas Tree Lighting at New Haven Green -- This Thurs, 12/5! 2013 Christmas Tree Lighting at New Haven Green -- This Thurs, 12/5! 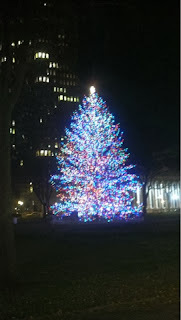 Christmas time on the New Haven Green back in 2011! Seasons Greetings! Holidays in New Haven bring about festive storefronts, beautiful street lights and a refreshing sense of Christmas and Holiday spirit. Among the festivities is the annual lighting of the beautifully decorated Christmas tree on the New Haven Green. Come down to the New Haven Green this Thursday, December 5th (rain date Friday, December 6th) for this free, fun, and family-friendly event for, 4-8pm. Let's get this holiday season into full swing! Interested in volunteering at the Tree Lighting? Read up!